The new social portal, by the citizens for the citizens, wants you to stop blaming the government for everything and help yourselves to make this country a better place to live in. Uzair Ahmad, the Founder of ActiveShehri.com, is an M.Phil student, a full-time employee and above all a responsible Pakistani citizen. He participated in Code for Pakistan’s Hackathon and built a prototype of ‘Active Shehri (Citizen)’ a portal to facilitate and educate the citizens. The site was officially launched last night, June 9, 2014 and is up and running now. The basic purpose of the social startup is to provide an online platform where people can report (personal, community and development) issues related to them and/or their area. Secondly, the portal is planning to create awareness among the citizens on a wide variety of subjects from “The process of applying for a domicile” to things like “How to file an FIR (police report)” so that they don’t have to rely on agents or third parties. 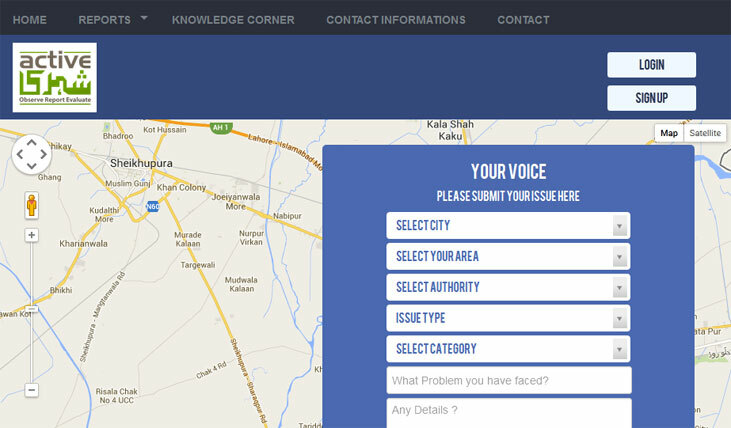 Moreover, the site is going to offer a free directory of contact information of concerned authorities and departments so that the people can directly get in touch with them in case a related issue arises. Personal issues could include problems like a person not being able to afford to provide education for his children. Now as much as it is the duty of the parents to take care of their child’s needs, it is also the responsibility of the neighbors and the society to help those who are in need. Pakistan is already considered one of the most charitable nations in the world. However, people are more willing to help when they know where their donated money is going to. With Active Shehri the location of the needy would be shared online so that the people in that area who are able and willing to help can get in touch with them. This will help societies and communities to better sustain themselves without any external aid. The community issues section, encompasses areas like health and sanitation requests, parking problems and appeals, crime reporting. Anyone can report an issue on the behalf of the community and Active Shehri will do its best to forward the application to the concerned authorities and seek its resolution. Coming to the development issues, this category can include things like an application of appeal about the need of a development project in an area. People can also use the Active Shehri portal to report a developmental project that came to a halt in the middle, like a school that is built and complete but isn’t functional. Once the problem is brought into the notice concerned higher authorities and officials, things are likely get back on track soon. Nope, the Active Shehri team doesn’t have a Gennie in a bottle that will magically grant all your wishes and provide all the solutions. The team is composed of regular human beings, like you and I, with a little extra sense of civil responsibility. The team has been in talks with authorities ( like the Chief of Civil Services Academy as well as other influential bodies) and the media (e.g. local news channel City42) for a while now. Their idea is to form network of people & authorities and involve media bodies to assist the citizens with their problems, make them better aware and more empowered to help themselves and each other. So far the startup is only covering Lahore and its constituencies and sub areas. The site features cluster reports and textual that show the status and details of issues reported through the portal, including the total issues reported, the ones in progress and the number of successfully completed and resolved reports. TechJuice thinks that it is about time someone took such a civil initiative. We hope that this project grows and flourishes successfully and wish the Active Shehri team the very best of luck in executing all their plans!